When you test drive 2016 Subaru Outback near Detroit, you may not be sure whether you're dealing with a tough sport utility vehicle or a comfortable family wagon. This vehicle comes in four trim levels: 2.5i, 2.5i Premium, 2.5i Limited and 3.6R Limited. You can select from up to nine exterior colors including Venetian Red Pearl, Crystal White Pearl, and Crystal Black Silica. Whatever you decide, ask your Subaru Outback Dealer serving Detroit Troy Ferndale Southfield MI what options the different models give you. The first thing you experience inside your test drive 2016 Subaru Outback is the technology that surrounds you. If you want to handle your phone and audio system, Bluetooth® technology lets your do so with your voice and steering wheel controls. The audio system can link directly to compatible mobile phones. Both you and your passenger can define your own temperature through the dual-zone automatic climate control, which uses CFC free air conditioning and filters that cabin air. Luxuriate in 143.6 cubic-feet of interior room that features premium materials on soft touch surfaces. You can power-adjust the driver's seat in 10 different ways and then memorize the settings. The higher-level models wrap the seats, steering wheel, and shift handle in leather to add luxury. Fold down the 60/40-split rear seat to accommodate unusually shaped cargo. When you need to see the clouds or stars, and feel the breeze in your hair, power-tilt or slide the available glass moon roof. Schedule your 2016 Outback test drive at Glassman Subaru. At your Subaru Outback Dealer serving Detroit Troy Ferndale Southfield MI, any agent can demonstrate these interior features. While you're approaching your test drive 2016 Subaru Outback near Detroit, you'll appreciate the sleek exterior of this Subaru. Wheel sizes range from 17 to 18 inches and can be made from steel or aluminum alloy. Ground clearance is at 8.7 inches to accommodate city streets and rural roads. In the front of the 3.6R Limited trim, high-intensity discharge low-beam projector headlights automatically come on and off based on external lighting conditions. On the lower level trims, lighting comes from projector beam halogens, also with automatic on and off. When visibility drops, the steering-responsive fog lights cut through the mist. To eliminate the raindrops that obscure the view, two-speed windshield wipers have a variable intermittent mode and mist feature to clear the glass. The rear window has a single-speed wiper with fixed intermittent mode. When you need to carry extra cargo, the roof rails integrate retractable crossbars and tie-downs to handle up to 150 pounds. A standard rear-vision camera displays whats happening in the back when you go into reverse, which helps you avoid obstacles. Schedule your 2016 Outback test drive at Glassman Subaru so they can help you price out your favorite options. The engine that will most-likely power your test drive 2016 Subaru Outback is the standard 2.5-liter Double Overhead Cam SUBARU BOXER® with 16-valves and horizontally opposed four-cylinder with Dual Active Valve Control System. The layout boasts maximum power transfer and better balance while canceling out the vibrations of pistons that moved from side to side. The Lineartronic® Continuously Variable Transmission uses fuel efficiently and increases performance, which reaches 175 horsepower at 5,800 RPM and 174 lb.-ft. at 4,000 RPM. A 3.6R Limited may also be available during your test drive 2016 Subaru Outback. It uses a standard 3.6-liter engine that produces 256 horsepower at 6,000 RPM and 247 lb.-ft. of torque at 4,400 RPM. Fuel economy maxes out at an EPA-estimated 33 MPG on the highway and 25 MPG in the city using unleaded gasoline and a fuel tank that holds 18.5 gallons. The symmetrical all-wheel drive improves the grip of the Subaru on the road with the X-MODE™ traction assist system that also includes Hill Descent Control. Vehicle Dynamics Control (VDC) constantly monitors steering angle, wheel speeds, brake pressure, lateral G forces, and vehicle your rate. If it finds a difference between your intended path and where the vehicle is straying, VDC automatically reduces engine torque and applies braking to correct the deviation. VDC also boasts the Traction Control System, which prevents the loss of traction by applying the brakes to any wheels that are slipping. Want to know more about the 2016 Subaru Outback Mechanics? Contact the internet professionals at Glassman Subaru for more details, pricing and features. 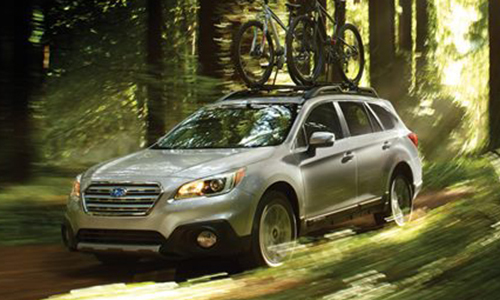 Glassman Subaru is your top source for Subaru Outback information. The last things you want to experience in your test drive 2016 Subaru Outback near Detroit are the safety features so you'll have to rely on explanations from your Subaru Outback Dealer serving Detroit Troy Ferndale Southfield MI. Any impact will activate the dual-stage deployment airbags, the advance frontal airbag system, side curtain airbags, front seat side pelvis and torso airbags, and driver and front passenger seat cushion airbags. The steering column is designed to collapse and absorb energy. To minimize whiplash, the head restraints are height adjustable in both the front in the back and tilt adjustable in the front. Technology also plays a large part in keeping you safe. Using two cameras mounted near the rear-view mirror, EyeSight® driver assist detects the danger of a frontal impact an issue of visual and audio alert. If you don't respond in time, it automatically applies the brakes. It also warns you if your Subaru is straying outside your lane and optimizes cruise control. With radar sensors, the Blind Spot Detection System alerts you if a vehicle wanders into your blind spot while Rear Cross Traffic Alert tells you if a car is approaching from the side as you are backing up. The anti-lock brakes helps you maximize control by preventing the wheels from locking up. Electronic Brake-force Distribution balances stopping power and Brake Assist applies maximum force to stop more quickly.If you're excited by the features of this Outback, then schedule your 2016 Outback test drive at Glassman Subaru right away. *The above information is regarding the base model 2016 Subaru Outback. Standard specs and features may change from year to year. Contact Glassman Subaru with any questions regarding the new or used vehicle you're inquiring about.